It all started with this beautiful loaf of bread I saw; Auvergne Crown. It was made by Judd of WeekendLoaver. Adaped from Daniel Leader’s book; Local Breads. I thought; ‘thats a nice looking loaf, it will be nice to eat it with strawberries for lunch’. It’s winter in Thailand and in the North the people grow strawberries. Two weeks ago I made the most delicious strawberry jam. And yesterday evening we went to the local market where they sold strawberries. We couldn’t resist and again we bought another kilo for another big jar of jam. So, for the bread I started with the levain. I had a stiff starter made with rye and all purpose flour waiting to be used. I grinded some wheat kernels to get a kind of ‘stone-ground whole wheat flour’. I added some tepid water, stirred and covered it and my levain was ready to get to work and I went to bed. The next morning I added the other ingredients and was in the middle of making yet another loaf. It’s a delicious hobby! I followed the instructions and was a bit surprised Judd didn’t score the round loaf. But, I thought it must be right and with enough heat the crust will crack open. It didn’t. It’s a nice round loaf with a delicious tasty crumb. Now it looks like a big bagel because it doesn’t have that beautiful open crust. Next time I will score the round loaf with a square and for now we just eat it. Yesterday we had the last piece with fresh strawberries! To make the levain, the night before,take 45 gram of stiff starter and mash with a whisk in a bowl with the tepid water. Add the flour and stir with a spatula until it comes together. Knead it to incorporate the flour. Place the levain in a covered container and let it sit at room temperature for 8-12 hours or until it has doubled in volume and the surface is domed. On baking day pour the water into the bowl op the stand mixer. Combine all the ingredients until they are incorporated. Cover and let it rest for at least 20 minutes for autolyse. Add the salt and levain and mix on medium speed until the dough cleans up the bowl and you reach a good gluten development. Transfer the dough to a lightly oiled container. Cover and let it ferment at room temperature for one hour untill it doubles in volume. This should take about 3-4 hours depending on the proofing temperature. I shaped the round bread or crown like I did with Maggi Glezer’s Royal Crown’s Tortano. Turn the fermented dough out onto a well floured work surface, round it and let it rest for 20 minutes. Sprinkle a generous amount of flour over the center of the ball. Push your fingers into the center to make a hole, then rotate your hand around the hole to widen it, making a large opening. Sift a veil of flour over the dough and cover it with plastic for proofing. About one hour before baking, preheat the oven to 230°C with a baking stone and a breadpan with stones on the bottom of the oven. Just before you slide the shaped dough on the parchment paper onto the baking stone, score the loaf. Quickly pour some boiling water in the breadpan for steam. The original recipe says to turn down the oven to 200°C and bake it for 35 to 40 minutes. I baked the loaf for 12 minutes with steam and took the bakingpan and the parchement paper out of the oven and baked it for another 30 – 35 minutes. Or bake the loaf until it is golden brown. Let cool for at least one hour on a wire rack. Oh! 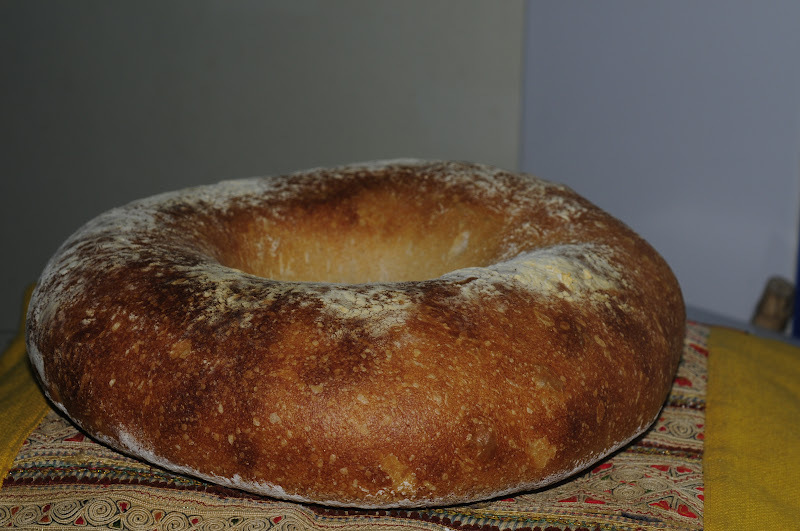 It does kind of look like a really big bagel - and a delicious one at that. And it's so perfectly even all the way around. Sounds amazing! Thanks Heather, this 'bagel' tasted delicious and the next one will look beautiful too.